Apprentice proving she can handle the heat! With an award-winning reputation for serving local, ‘farm-to-fork’ produce and exceptional food, the Bluebird Kitchen and Smokehouse in Warwick is the perfect learning environment for passionate, up-and-coming cook, Julia Walker. In April 2017, Apprentice and Trainee experts, BUSY At Work, signed up Julia (then a year 11 student), to the school-based apprenticeship opportunity at Bluebird Kitchen, owned by husband and wife team, Katie and Jim Osborne. When Donna Howard from BUSY At Work first met Julia, she knew she had found the perfect match for the business. Julia showed a mature outlook and expressed a determination to take her cooking career as far as possible – and to one day travel the world with her skills. “Julia absolutely loves working at Bluebird Kitchen and everyone loves Julia! Every time I am there the staff and owners have nothing but praise for her. She is an Apprentice that will certainly excel in what she wants to achieve”, Donna stated. Owners Katie and Jim agree. 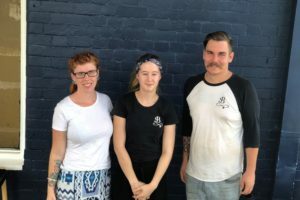 “Since starting with us, Julia has shown a true hunger & eagerness to learn all facets of Commercial Cookery and what it takes to make a small business grow and succeed in our community”. “Her drive to learn outside of work hours is evident – going above and beyond to purchase specialised tools to further her understanding and skillset at home. This will greatly benefit her ability to work with our Head chef”, the pair further stated. Turning a passion for food into a career takes a certain personality – and it appears Julia has that in spades. “Julia displays a strong level of respect and on many occasions has shown she has a true appreciation of the hard work we put in as owners, clearly evident in her own hard work & team motivation. She can see the bigger picture! In our 13 years’ experience in the industry, with many apprentices over the years, Julia is truly an asset and we haven’t seen anyone quite like her before”, the owners Katie and Jim emphatically stated. Managing Director at BUSY At Work, Paul Miles, stated: “Apprenticeships are vital to industries where a skills shortage is evident, as is the case with commercial cooking, and it is through the support of businesses like the Bluebird Kitchen that young apprentices such as Julia can thrive in their chosen career paths. It is a win for everyone in the end, addressing a much-needed skills gap and providing future generations with industry skills and career paths”. Right now for Julia, the future looks bright and the world is bound to be her oyster!